It's an unfortunate truth that sometimes during a military career, a member may experience a severe family hardship which requires his/her presence to resolve, with circumstances which make resolving it with emergency leave impractical. 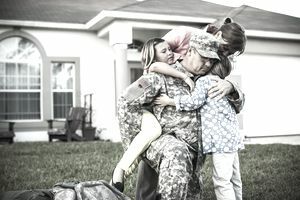 To help military members in such situations, each of the services has developed a program which allows military members to be re-assigned, or temporarily deferred from the assignment if they have a severe family hardship which requires their presence to resolve. The Air Force, Navy, Marine Corps, and Coast Guard call this program Humanitarian Assignments. The Army calls their program Compassionate Assignments. While not a component of Humanitarian/Compassionate Assignments, the Exceptional Family Member Program or EFMP warrants special mention. EFMP was developed to make sure military family members (dependents) with special needs (medical, educational, etc. ), receive the special attention they require. A small part of this program is integrated into the military assignments system. When a military member has dependents (spouse, son, daughter, step-son, step-daughter, etc.) with special needs, they are enrolled in EFMP. If the member is selected for an accompanied assignment, one of the first things that happen is the EFMP folks at the losing base contact the EFMP folks at the projected gaining base to determine if the dependent's special needs can be adequately addressed at the new location. If not, the assignment is canceled. It ensures that military dependents are not forced to move to locations where their special needs cannot be adequately addressed, either by the military installation or in the local community. EFMP does not restrict a member from doing his/her share of unaccompanied assignments, however, so they can still deploy. The program merely makes sure that members aren't selected for an accompanied assignment to areas where their dependents would not get the special attention they require. A Humanitarian Assignment is a special assignment authorized to alleviate a hardship so severe an emergency leave cannot fully resolve it. While each of the services has different procedures, there are some requirements which are common to all the branches. To qualify for a Humanitarian Assignment consideration, a military member must have a documented and a substantiated problem involving a family member, which is significantly more severe than other military members experience. "Family Member" is generally defined as spouse, child, father, mother, father-in-law, mother-in-law, a person in loco parentis or other persons residing in the household who are dependent for over half of their financial support. In the Coast Guard, father-in-law, and mother-in-law do not qualify as family members for the purposes of Humanitarian Assignments. The problem must be able to be resolved within a specific time-frame (six months to two years, depending on the branch of service). Military members are expected to be available for worldwide assignment, at all times, according to the needs of the service. That's a large part of why they get a paycheck. For those who have a permanent or prolonged family problem which prevents reassignment, humanitarian discharge is generally the appropriate action. The Comptroller General has ruled that the military services cannot fund an assignment relocation for humanitarian reasons only. That means there must be a valid slot at the gaining base for the person's rank and job. For example, the Air Force would not be able to reassign an F-15 Fighter Aircraft Mechanic to a base that does not have slots for F-15 Fighter Aircraft Mechanics. However, sometimes a service will allow a member to re-train into a different job, to fill a required slot at the Humanitarian Assignment Location. Reassignment may be authorized when there are extreme family problems, and the soldier's presence is needed. A soldier may get a deletion or deferment from an overseas assignment if the problem requires them to stay in the U.S. for a short time. If the problem is chronic or can't be resolved in a short amount of time, a compassionate discharge procedure is generally the most appropriate action. Consideration for reassignment may be given in cases of extreme family problems that are not expected to be resolved within a year if it meets the needs of the Army. Requests are made on DA Form 3739, Application for Assignment/Deletion/Deferment for Extreme Family Problems submitted through the chain of command. It must be done by the soldier. Commanders can disapprove compassionate requests when they do not meet the prerequisites. The Army Personnel Command has approval authority for a compassionate reassignment. The soldier needs to be present to resolve the problem, and it can't be done with leave. The problem cannot have been foreseen when the soldier last entered active duty. A family member includes spouse, child, parent, minor brother or sister, a person in loco parentis, or the only living blood relative of the soldier. If not one of those people, they must be documented as a dependent or, in the case of parents-in-law, no other member of the spouse's family can help. For reassignment, a job (MOS) of the correct rank must be available at the requested installation. A pending assignment may be deferred until the request is decided. However, soldiers in basic training will not be deferred from AIT pending the results. The problem must be temporary and resolvable within one year, although longer deferments are sometimes approved. If a compassionate action request is disapproved, a soldier may only request reconsideration for the same family emergency one time. If that is disapproved, there will be no further reconsideration. What Are Air Force Humanitarian Assignments?